In the beautiful city of Chalkis, the couple Suat & Ekaterina Atalik was hosted by the direction of the luxurious facilities of Lucy Hotel to conduct the first game between spouses in the history of chess. 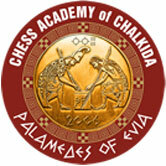 In a familiar environment, the philhellenes players battled for three days to honor the Greek hospitality and the Chess Academy of Chalcis who refused to accept the illegal decision of the Turkish Chess Federation to ban their participation in competitions within and outside Turkey, a decision that (unfortunately) the Greek Chess Federation accepted and, moreover, illegally imposed its practice to the Greek territory. Unfortunately for Greece, in addition to the IMF (International Monetary Fund) and the Troika, we also now have to deal with the TCF (Turkish Chess Federation), which is able to enforce its decisions through the Greek Chess Federation. 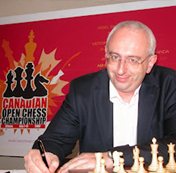 The latter has chosen to confront Chalkida Chess Academy in an authoritarian way, because CCA refused to comply to an ambiguous decision to forbid the participation of a particular chess player by means of a letter to tournament organizers. Let it be noted that the GCF is the only federation worldwide that has agreed to enforce this decision of the TCF. 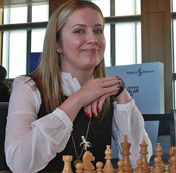 Chalkida Chess Academy “Palamedes of Evia” will host a friendly chess match between Turkish Grandmaster Suat Atalik and his wife, IM/WGM Ekaterina Atalik, as a prelude to the International Chess Tournament “Negroponte 2012”. This unique event is the first ever chess match between husband and wife, who also happen to be the winners (overall and women’s category respectively) of the previous edition of “Negroponte”, in 2010. Hosting this match in Chalkida is a vivid example of the true spirit of Greek hospitality, as well as the increasingly strong bonds of friendship between the Greek and Turkish people. This aim is furthered by the fact that Suat Atalik was, in 1994, the first ever sportsman to play in the Greek League for a greek team in any sport.